It is with great sadness that we mark the too-soon passing away of Angola’s only science documentary filmmaker, Kalunga Lima, who died December 19, 2011, in Lubango, of a heart attack. Our heartfelt condolences go out to Kalunga’s wife, Nela (Maria Manuela) and his three children, Carlos 16, Rafael 9, and Luena 7. Kalunga aired his first feature length documentary Saving the Giant Sable Antelope on May 13, 2010 to members of the Angola Field Group. His next project was inspired by a presentation he attended of the Angola Field Group at the Viking Club in July of 2009, Uncovering the Hidden Remains of Angola’s Ancient Giants. He was deeply impressed by Dr. Jacobs and the Paleoangola team’s work with discovering dinosaur fossils along the coast of Angola and he wanted to spread the news of these hidden treasures to the rest of Angola. Kalunga was the force behind bringing to Angola the replica of the Angolatitan presently on display at the Geology Museum and became involved in other aspects of the Paleoangola project. He was working on a documentary about the coastal waters of Angola for Expo 2012 in Korea up till his untimely death. 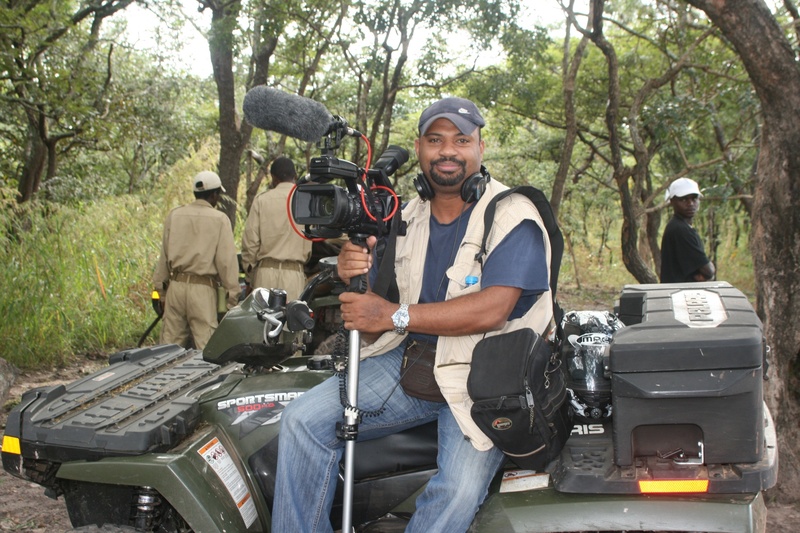 He wanted to make Angola a better place by bringing an awareness of nature and wildlfe to Angolans by combining scientific research with documentary film making. We will all miss Kalunga and we hope the vision he had will be taken up and carried forward by others. 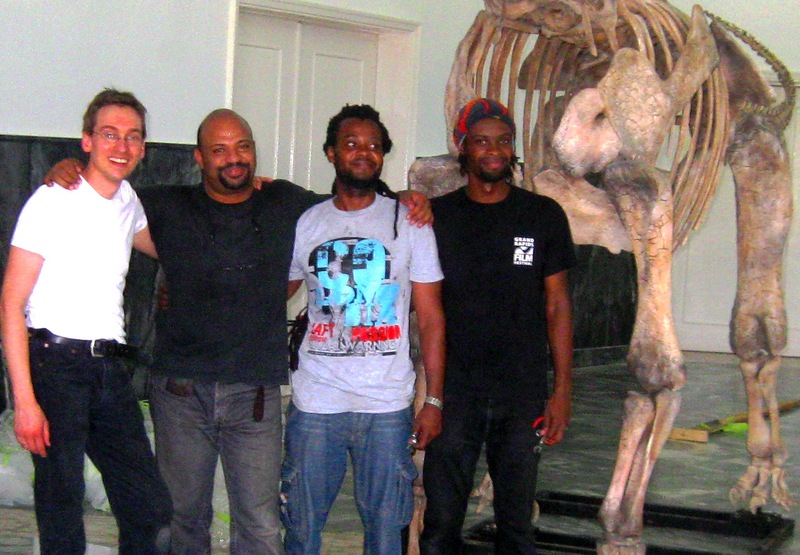 Kalunga, second from left, after putting up the Angolatitan when it first arrived in Angola. It was with great shock and sadness that we learned of Kalunga’s untimely death. He was of enormous help and support to our family in 2001 when my husband, Alan, visited Angola in search of our son, Jason. Although we knew nothing of Kalunga’s latest documentaries, he will be forever remembered in our own documentaries of that time. Without Kalunga’s help, we would never have uncovered the probably fate of our abducted son and his colleagues. We are forever grateful for Kalunga’s (and Nela’s) kindness at that time. We can only pray that Nela and their children can accept his loss with courage and love. They will always be welcome at any time in our home. I am sad and troubled by his death as I have only learned now that he is gone. We did not communicate much after we went our separated ways. All I can say is that he was a special and a caring person and we shared some special moments in St. Lucia. We had many scuba dives and he taught me alot about life and the different cultural differences.Kalunga my dear friend, you had a profound effect on my life and I want you to know that I will never forget you… . I am so sorry to learn of the death of Kalunga Lima. Kalunga and I worked on a couple of projects in St. Lucia. We lost touch with each other and I have been trying to get in touch for a while. I checked Facebook and didn’t find him. Today, he entered my mind while going through some unfinished projects. I decided to google his name and found out the real sad news. My sympathy to his family and colleagues.